Is HTC teasing a Siri and S-Voice rival? HTC may be about to add a voice-controlled personal assistant for phones like the One X if a posting on its Facebook page is anything to go by. 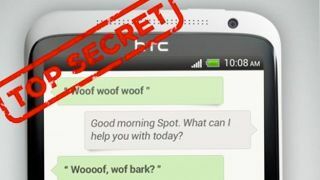 The Taiwanese manufacturer added a mocked-up screenshot from the Sense UI which showcases an application translating the woofs and barks of a pet dog into English. Yes, really. The snap, shown above, is sardonically labelled with a "Top Secret" stamp with an asterix stating: "Sorry dog fans, this isn't real." The caption below adds: "Ever wonder what your pet has been trying to tell you all these years?" It would be strange if there was zero point to this posting, so it seems fair to jump to the conclusion that HTC does have something up its sleeve for a later version of Sense. Of course, Samsung recently entered the voice control arena through S-Voice on the Galaxy S3 handset, to challenge Siri for iPhone, which is soon to be available on new iPads also. Earlier this week LG jumped on board with its Quick Voice app, so it would make sense for HTC to launch its own voice-powered innovation.